Most instructions for building geodesic domes involve making a framework first then covering the framework with a suitable material. This works fine but there is a faster cheaper way to build your dome that most people haven’t even considered. What is a stressed skin dome? A stressed skin dome has no supporting framework at all; the skin is designed to support the whole weight of the structure without beams, joists, guy wires or anything. Sounds impossible but it’s actually very simple. I built a 7-meter diameter dome using 16-gauge aluminium sheet, that’s a clear span of 24 feet with a material that’s less than 2mm thick! Building a full size stressed skin dome is very much like building the Paper model, but instead of using paper glued together we use aluminium sheet which is riveted together. First we need to make two patterns, there are only two different shaped triangles in a 3v geodesic dome so this isn’t a complex task. 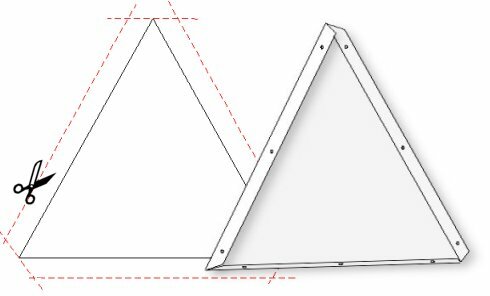 A 50mm tab is added to all sides of the pattern to form the tabs for joining panels together (see diagram below). You’ll need to get a metal fabricator to drill or punch some slots in the tabs and bend them at 90 degrees, the angle doesn’t need to be exact because the tabs are quite flexible and will bend to the correct angle when you assemble the dome. To assemble the dome follow the same instructions as the paper dome, you can build the paper dome first to get an idea how it goes together. Use mole grips to pull the panels tightly together before you bolt/rivet them. You will need to rivet a cover strip over all the joints and finish the dome with a waterproof coating. Warning only use stressed skin construction to build pure domes that are firmly fixed down. Do not cut large openings or add on extensions, this will severely weaken the structure! Interesting point there Colin, you are right in that there is a slight rise to the half hex panels but this is fixed by slightly distorting the base of the dome. Look at the image below, as you can see the pentagon is pushed out a little and the point of the half hex is pulled in. The black line is true and the red one shows the distortion required to make the base flat. I want to know if anyone has ever considered making a dome by using a very large inflatable balloon, and then covering it with insulating foam which, when cured, can be cut for things like windows and doors, and covered with whatever decorative or protective materials inside and out that one wishes? I don't know if one could also use some kind of concrete, but I've thought maybe chicken wire and concrete instead of the foam, but same technique. (The balloon needs to be pretty heavy duty to prevent punctures.) The result would still need to be placed on a foundation prepared for the purpose. Fiberglass might also be another building material. Therese, There is a company called the Monolithic Dome Institute, they make "Balloons" and cover them with Foam and Concrete then cut the windows out. Just search for monolithic dome, you will find them. These house are like really cool! i am thinking about a dome made of chip board. Not a geodesic dome but stips of chipboard screwed into concentric circles starting at the base. By using two layers and exterior wood glue on all six sides of each board the board could be lapped to each other from left to right as well as from bottom to top. I think a modest 12'-20' span could bear a wet snow load of 2'-3'. No other internal truss would be used. I would like to use drywall screws dipped in varnish several times and regular exterior wood glue. The foundation would be a cut circular trench filled with gravel and then a corse of gabions- gravel filled wire cages. Or a concrete grade beam on top of the the gravel. Still need a cheap tie down though but i'm sure this could be done. The gabins would alow a shalower pitch dome. Also a skylight at the top would eliminate the increasing deflection required near the upper concintric circle. or a second type of panel could be used as a cap. this is an attempt at lowest cost with reasonable labor houseing for homeless, disater relife and eco folks or for temporary and auxilliary building. No insulation would be needed with a wood stove as it will keep an uninsulated building warm economically. For insulation a layer of papercrete could be used. Any number of final sealing system could be used. the exterior wood glue could be painted while a elastomeric roof caulk could seal the gaps probably with a fiberglass tape knifed over the seems. Im thinking the sno coat system used for roof or the similar Gayco deck coating. both rated for the water and sun. chip board screws glue tools. scaffolding from the interior( a satep ladder foundation trench tie down and sealant are all as cheap and as accesable as i can imagine a rigid shelter being in this size range. only adobe is ceaper but the labor i think puts it out of reach. besides living expenses during the long construction period are probably offseting the savings of free materials. Any comments are welcom and no im not an engineer and have no idea what im talking about but am unwaveringly sure of my idea! Hello all :-) Very good site, the calculator are very usefull :-) I have just one question, i want to make a Very big dome for my wedding. About 100feet diameter :-D (i am crazy i know ) :-) but i would like to build it with a technic wich make the structure and the cover of the dome in one times. And i think to use polyurethane foam. Do you think that foam can sustain it own weight on this dome size? What's thinkness of foam the wall need to be ? Thans very much Have a nice day ! !